There are lots of great places to eat in Memphis, as I have been chronicling recently, but since we left Chicagoland behind we have been trying to find a replacement for our favorite Mexican restaurant, Mixteca. Finding somewhere to replace the hand-squeezed margaritas, fresh ingredients and homemade dishes made by Claudia and the Mixteca crew has not been easy. The first two places we ate at were “authentic” in that they had sombreros on the walls and brightly colored booths, but the food was very generic. Everything had the same mass-produced look and taste to it, which is bound to happen when they are both prolly ordering their food from Sysco. I’m not saying it wasn’t good, it just wasn’t as good as we were used to eating. I won’t even go into how bad Tammy said the margaritas were at these places other than to say the only thing hand-squeezed was the stem of the glass as it was delivered. We asked some of our local friends for suggestions and had more than one person say we should try Las Delicias, which according to Google Translate means, delight. We headed down to the location on Quince with high expectations. The parking lot was full, so we were expecting a long wait but surprisingly we were at a table within 10 minutes of walking through the door. Las Delicias’ decor was definitely different from the other two places we had visited. The walls were painted in modern beige and yellows, with white door frames and borders accenting everything. The granite-topped bar just behind the hostess stand was standing room only. The menu at Las Delicias is simple. There’s no crazy photos, no order by number or combo plate to be found. It’s all very basic. We were given our complimentary chips and salsa, which in most places is average at best. That was NOT the case at Las Delicias. The chips were definitely homemade and the salsa was the freshest I have tasted in a long time. If you love cilantro then you will love this salsa. We ordered the guacamole, which was one of the items on my Food Bucket List. We were surprised at how chunky the guacamole was when it arrived at the table, but the taste was very good. The only negative was that it was a little salty, but not overpowering. 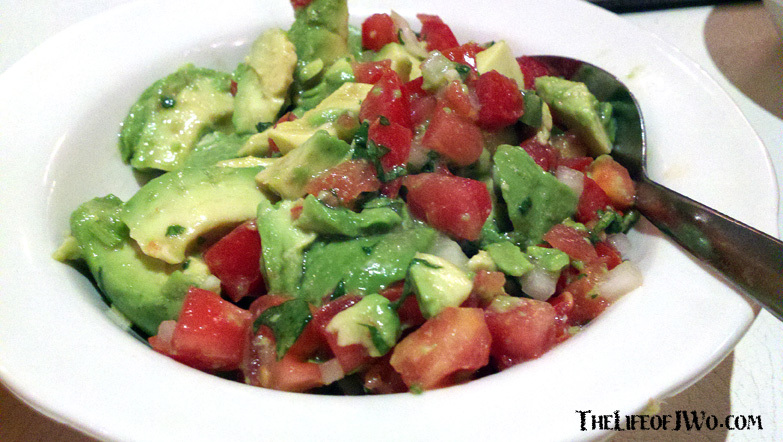 Las Delicias Guacamole: Another item checked off the Food Bucket List. Tammy ordered a chicken and gringa (marinated pork w/ cheese) taco without onions. I got a chorizo and gringa taco, with onions and cilantro, a pork tamale and a side of beans. 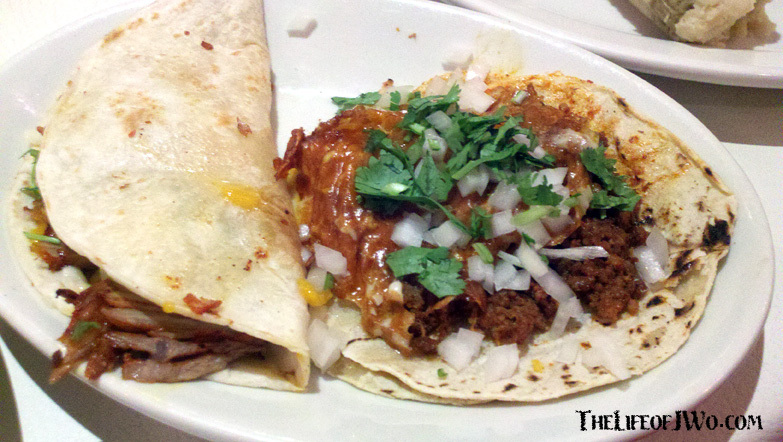 The Gringa taco (left) and the chorizo taco from Las Delicias. 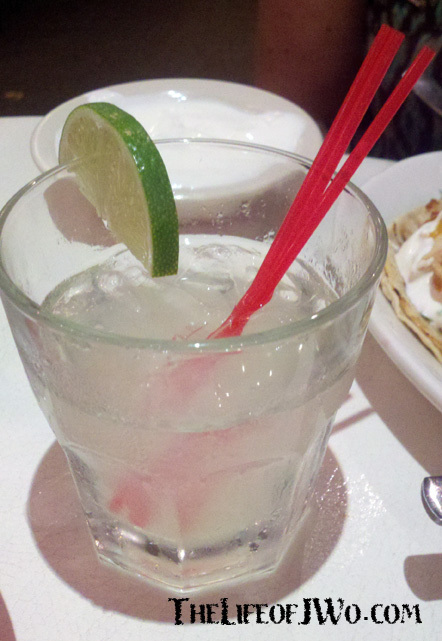 Even though they forgot to salt the rim, it was still pretty good. The tamale was OK, but definitely not as good as the black bean or shrimp ones I used to get at Mixteca. What Tammy has really been looking for since we moved is a good margarita, so of course she ordered one. She could tell the limes were fresh squeezed, which instantly made it better than the ones she’s tried at other places. While it was good, it didn’t come close to replacing Claudia’s creations. It’s really not fair for us to compare the Mexican places down here to Mixteca, because we have them on such a high pedestal, but Las Delicias definitely is the closest thing we’ve found. Gallery | This entry was posted in Daily Life, Food and tagged daily life, food, home, humor, life, Memphis, Mexican cuisine, Postaweek2013, Travel. Bookmark the permalink. Jason…ever think of adding ‘food critic’ to your resumé? You definitely have the knack for it and, IMO, your reviews aren’t Homer Simpson-esque, re: everything is “10 thumbs up!” Sounds like things are working out for you and Tammy down there, have a great 4th! distributed this blog with them all. Remarkable work and a really inspiring read. Great things will surely be happening with you soon.